I splurged on chicken last weekend. Yeah, I know, that doesn't sound right. People splurge on Wagyu beef and heritage breeds of pork. People buy chicken because it's cheap. But Willy Carithers, the namesake of Willy's Butcher Shop in the Homberg District of Knoxville, tempted me. 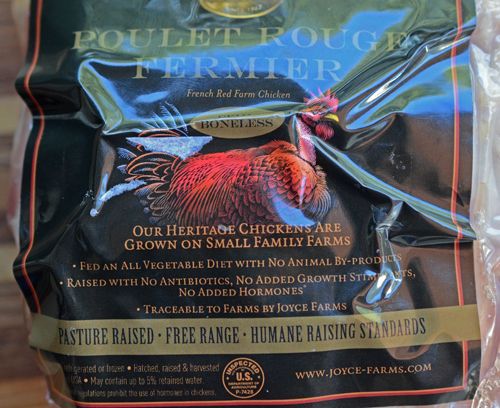 He had a semi-boneless Poulet Rouge Fermier (Famer's Red Chicken) from Joyce Farms over in North Carolina. According to the Citizen-Times, Joyce Farms went to France to find the finest chickens available and came back with the ugliest. The specific breed is cou nu which means naked neck. They are ugly - Google it. But they are also very tasty. They take almost twice as long to raise to harvest. Joyce Farms takes every step to make sure they are perfect, including, select vegetarian feed, no antibiotics or hormones, free range, and I wouldn't be surprised if each bird got it's own personal masseuse and Netflix account. "It doesn't taste like chicken - it tastes like meat." So this recipe doesn't require a Poulet Rouge Fermier, you can use the smallest fryer you can get at the supermarket. And it doesn't require a semi-boneless bird, you can just spatchcock a chicken or ask your butcher to do that for you. But it sure was a nice splurge and you can tell the difference in taste. For this cook, there are options. I used GrillGrates at a lower temp than I normally grill to ensure a more even cook. You could use a raised direct set up for a kamado grill or gas grill and get the same effect in this case. This is where my Grill Dome gave me an advantage - it is already slightly raised compared to my Big Green Egg. The firebowl and fire ring are each about 3/4" taller than the ones in my Egg so the grate sits 1 1/2" inches higher. Or you can just skip that and cut your grill times to 5 to 6 minutes on the skin side down, watching carefully to avoid burning it. 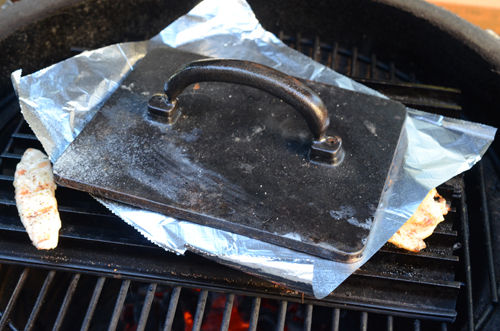 You can also speed up your cook by using a grill press or foil wrapped brick. 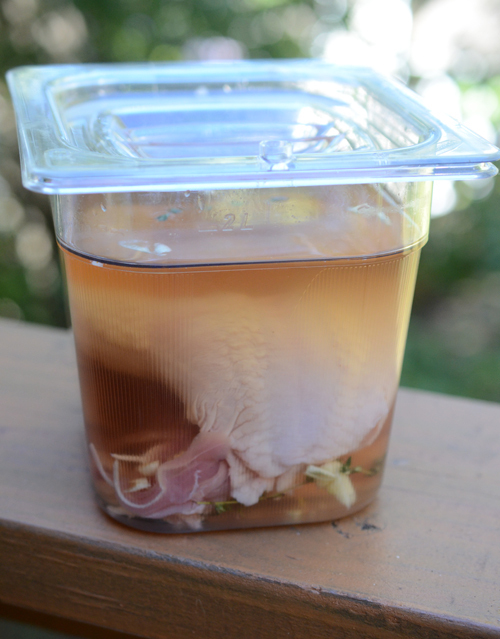 Place the chicken in the brine and keep refrigerated for 4 to 6 hours. 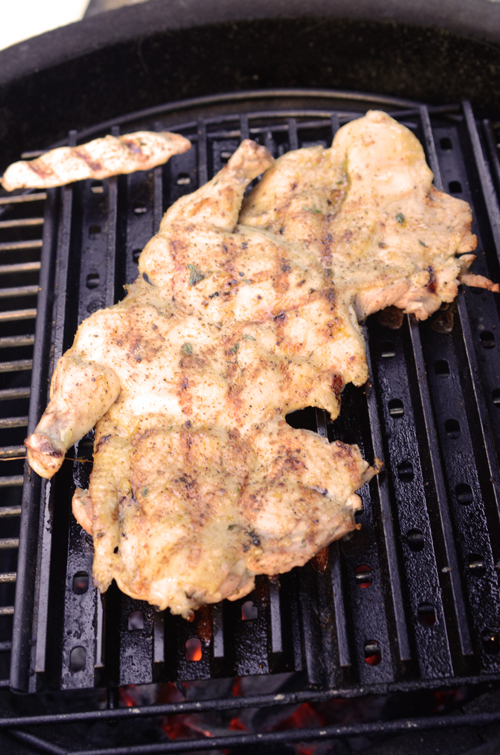 Preheat your grill and GrillGrates to 350°F (medium). Meanwhile make your browned butter. The ingredient link gives you a good how-to for this. 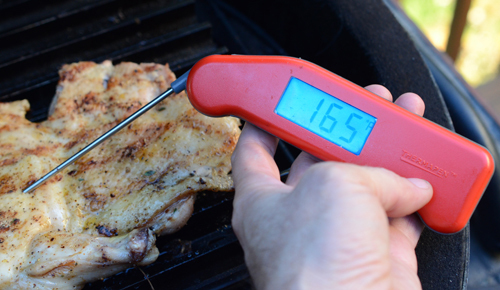 You should be able to do it in the time your grill preheats. Trust me, you want the brown butter. Season your chicken on both sides with the Meat Church Season All and black pepper. Sprinkle the thyme leaves on the skin side. 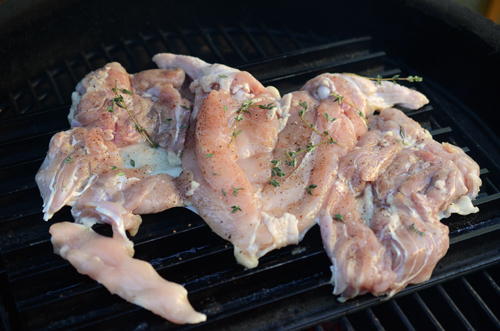 Grill the chicken skin side down until golden brown, 6-8 minutes. Flip the chicken, top with a grill press or foil wrapped brick, and continue cooking until the breast reaches an internal temperature of 165°f, anywhere from 6 to 12 minutes depending on the size of your chicken. Remove to a platter and drizzle with the warm brown butter. Slice and serve. 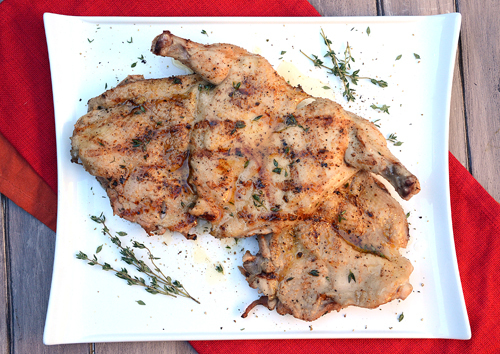 Commodity chicken - if you are using a commodity chicken rather than a semi-boneless heritage breed bird, you will need to slightly increase your cook times about 1 to 2 minutes to account for the larger size and bones. Bragg's Liquid Aminos - We're able to get this at about half of the local grocery stores. It's a gluten free item that people with celiac disease use as a soy sauce alternative. I just happen to like it better than soy sauce and it has a umami note to it. You can substitute regular soy sauce. Browned butter - Just don't. Don't try substituting melted butter or clarified butter. Take the few minutes while the grill is preheating to make it. The nutty flavor from the darkened milk solids elevate the dish. I have been using these 2 liter containers (Rubbermaid we bought at Sams) a lot this year. Great for brining like this or prepping ingredients for made to order foods at events. They fit nicely in our refrigerator. A semi boneless chicken from Joyce Farms only has the first wing bones still attached (similar to "hotel" or "airline chicken breasts"). This would also be good for stuffing, rolling back up, tying, and then fire roasting whole. That's my next plan. Normally I'm using GrillGrates for sear marks but today I was using it more as a partial buffer. 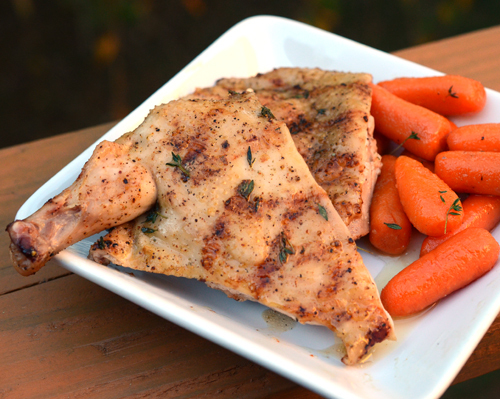 The grill press or brick is an old Italian trick for chicken. It flattens the bird out even more than just spatchcocking and it speeds up the cooking time. I normally only take my commodity chickens to 160°f and let the carry over cooking finish bringing up the temp but these smaller heritage birds are leaner and thinner so they don't do as much carry over cooking. 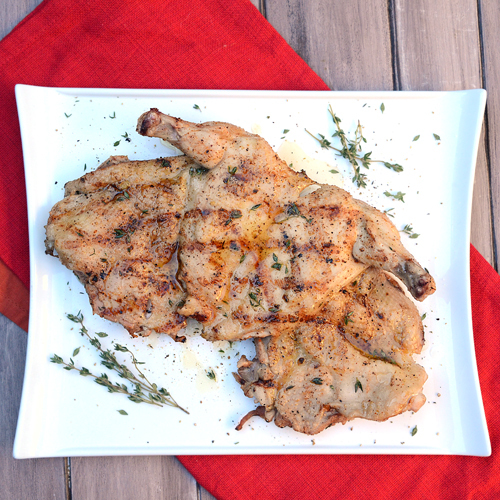 The brown butter serves as a luscious condiment for the chicken, adding to the overall flavor profile without covering up the taste of the chicken. My buddy Curt McAdams makes a great brown butter potatoes that would go well with this. The flavor is described as "slightly game like" but I'd say it's more like "chicken that has the mute button turned off". It tastes like chicken should, if it wasn't mass produced. So would I go with a Poulet Rouge Fermier every time I want chicken from here on out? No, the price point ($19 to $22) keeps it in the splurge category for me but after tasting it, it is a splurge that I will do again. It is something distinctive deserving of a special occasion. I'm looking forward to trying one stuffed, rolled, and tied roulade style. I'm thinking maybe goat cheese and spinach or maybe rice, cranberries, and almonds. Got any other ideas? [FTC Standard Disclaimer] I have no connection with Joyce Farms, received no compensation for this post, and paid full price for the chicken.